In this important match Genoa missed Bertolacci because of his stupid red card in the last match against Fiorentina and the injured Rossi, Vargas and Floro Flores. Already in the 6th minute Genoa took the lead when the free-kick of Borriello was touched by the Siena-wall and went in the far corner: 1-0. The next 25 minutes it was only Genoa that attacked and we played very good, but we didn’t score the second goal. As often in football if you miss many changes the goal arrives at the other end of the field: Emeghara 2 minutes before halftime: 1-1. In the second half referee Rocchi first refused to give Siena a penalty, but one minute later he gave Siena a penalty for nothing: Rosina scored, 1-2. Mr. Ballardini immediately brought an extra striker in the team with Immobile and for the first time since months our youngster played very good. In the 26th minute the Siena defenders again couldn’t stop him and he passed the ball towards Bosko Jankovic who easily scored the equalizer: 2-2. 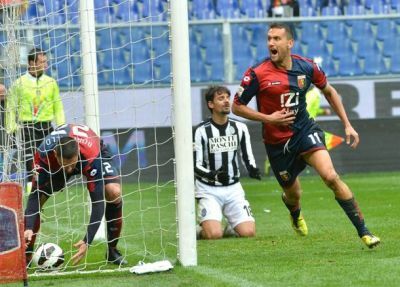 In the last minutes Genoa did everything to score the winning goal, but goalkeeper Pegolo (ex-Genoa) saved his team a few times. With the draw Genoa stays 1 point above Siena, but now only 3 in front of Palermo that beat Roma on Sicily. Next week we play in Napoli. Of course Genoa has many players who play in their Natioal team like Granqvist, Kucka and Vargas. But since Criscito left us to Zenith Sint Petersburg we did not had a player in the national team of Italy till Luca ‘Dustin’ Antonelli was selected today to play in the Squadra Azzurri. Yesterday Luca scored his first goal with Genoa and today he already was rewarded for that. 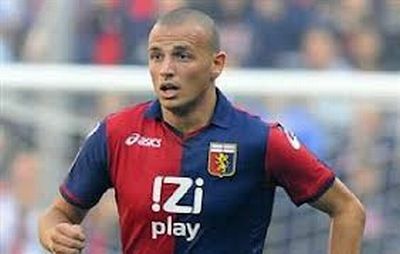 This year Antonelli plays with a lower salary with Genoa which he asked himself last year when he did not play very well. A special player with a Genoa-heart just as his father who also played in our fantastic red and blue shirt: Luca Antonelli. Genoa lost both matches, but we deserved more. Like Andreas Granqvist already told us during the handover of the trophy of Genoano of the year it’s easy to the big teams to have a penalty, but it is very difficult to get one against them. In Luigi Ferraris Milan made 2 clear handballs in the penaltyarea which even their ex-President Berlusconi (76 years old) admitted that he had seen them easily on tv. Also in the first half Granqvist was fouled when he wanted to score a header. Referee Damato refused to see it all, so Milan did win by 0-2 with goals of Pazzini and Balotelli. In the first half in Firenze Fiorentina was the best and only team in the field. They deserved at last 2 goals but only scored an irregular one when Aquilani first pushed Granqvist to the ground and then scored. After the break with Jankovic and Jorquera in the team Genoa played very strong and was equal to Fiorentina. We scored twice with Portanova and Antonelli, but also Fiorentina had 2 goals in the 2nd half: an error of our substitute goalkeeper Tzvoras who lost the ball that was in his both hands and an unlucky own goal of Cassani who got a corner on his sholder. Only Siena earned 1 point against Cagliari, while Palermo and Pescara lost their match, so we are still above the relegation-zone. Saturday 30th March we play the important match at home against Siena. If you loose: never blame the referee, unless…. 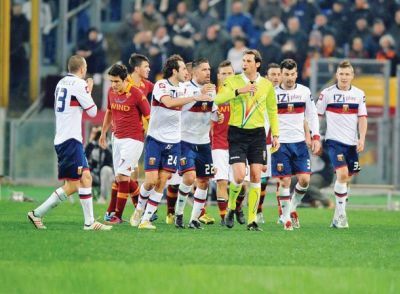 Like almost every year Genoa played a good match in Rome and deserved at least a draw, but referees are afraid in Rome if A.S. plays at home. Especially Totti knows this and his 225th goal in the Serie A was overshadowed with an accident in which he deserved a red card and not our Juraj Kucka. The referee who is “man enough” to give Totti a red card in Olimpico is not born yet, but the big question of his career remains: will we remember Totti as a great footballplayer (which he surely is) or more as a very irritating bad person ? At the moment the last! In the 16th minute Gervasoni gave Roma a penalty when De Rossi felt down himself in the penaltyarea. Totti scored the penalty which brought his total on 225 which makes him number 2 in the history of the Serie A. Just like in the old Roman Colloseum days the public got where it came for (the 225th goal of Totti) and Gervasoni arranged it. 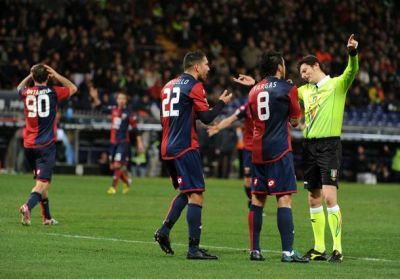 Just before halftime the referee had to give also Genoa a penalty when Borriello was fouled inside the penaltyarea. Our topscorer made the penalty himself: 1-1, halftime. Just as in the first half Genoa was the best team after the break but Dutch goalkeeper Maarten Stekelenburg played a very good match. Out of a corner Romagnoli scored 2-1 by surprise, which was the sign for Ballardini to play even more offensive and bring Jorquera and Immobile in the team. After first again Stekelenburg stopped Genoa a few times the final knock-out was made by Gervasoni who gave Kucka and Totti both a yellow card after a regular action of Kucka. The protest of Totti meant that our best player had to leave the pitch just as Ballardini a few minutes before when he walked 2 meters inside the field to ask his players to stop the game because of the injury of Roma-striker (!) Osvaldo. With 12 against 10 Perrotta scored the deciding 3-1 just before the end of the match. A big party in Olimpico with Totti and Gervasoni as the most popular persons. Friday against Milan we have to miss our best player Kucka, but Ballardini can be on the bench because he is not punished after his red card, which is very unusual in Italy. Hopefully the punishment goes to Gervasoni. Again a draw in an away-match, which means that Ballardini is still unbeaten. 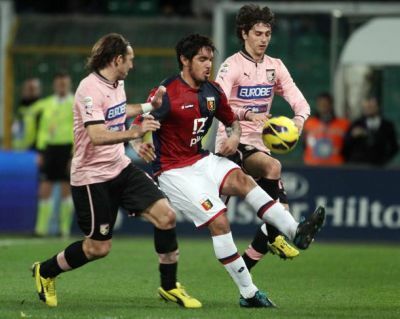 The distance between Genoa and Palermo is still 6 points. The goal behind keeper Frey now is 278 minutes clean, which is a record this season. The 0-0 draw was an honest result with a big chance to both teams: just before the halftime-whistle Marco Rossi was fouled at the moment he wanted to score the openinggoal but referee Orsato refused to give us a penalty. In the 2nd half Mauro ‘derby’ Boselli fired a great shot on our goal but Frey saved us. Genoa now has 26 points in 26 matches. Next Sunday-evening we play in Rome against Totti c.s..